JAMESTOWN – A familiar name will be filling a recently vacated seat on the Chautauqua County Legislature. Chautauqua County Democratic Party Chairman Norman Green tells WRFA that Jamestown Democrat and former county legislator Chuck Cornell will return to Mayville to represent District 12, which covers the northeast side of the city of Jamestown. 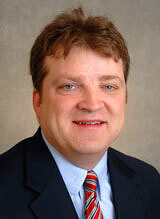 Cornell will be taking over the seat recently vacated by Jamestown attorney and fellow Democrat Fred Larson, who was recently appointed by the city of Jamestown to serve as its second full-time city judge. Green says Cornell was selected by delegates of the Democratic Party who live in the 12th district. Cornell will still need to accept the appointment and the legislature is also required to act on it, which will most likely take place during the May 28 voting session. Cornell currently serves as the director for the Center of Regional Advancement at SUNY Fredonia. He also served on the Chautauqua County Legislature from 2006 to 2009. During his time on the legislature, he served as Majority Leader, Chair of the Planning and Economic Development Committee, and member of Audit and Control Committee. In 2004 and 2005 he also served as the County Legislature Clerk. Cornell also ran as the Democratic Candidate for county executive in 2009, losing to Greg Edwards. He is the husband of Lori Cornell, who sat on the county legislature for two terms, from 2010 through 2013. Cornell is currently out of town so WRFA was unable to reach him for comment.